A man was hospitalized after being struck by an oncoming bus on the Lower East Side Monday, according to DNAinfo. 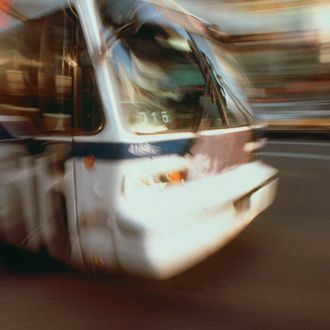 It’s at least the third time this month an MTA bus has hit a pedestrian. The man, who remains unnamed, was crossing Madison Street at Jackson Street around 11 a.m. when the bus struck him. Witnesses said the bus reversed and then hit the man again, pinning him under the vehicle. The driver waited at the scene until authorities arrived to free the pedestrian, who was later taken to Bellevue Hospital with a serious arm injury, according to NBC New York. He remains in serious condition. Earlier this month, a 59-year-old pedestrian was crossing a street in Queens when she was struck by an MTA bus and killed. Two days later, an out-of-service bus killed a 70-year-old woman in a Brooklyn hit-and-run, and the driver was charged with leaving the scene.